Morehead State found the cup early and often, surpassing its best mark for field goal percentage. MSU tallied 31-of-52 from the floor, which accounts for a 59.6 percent efficiency. The previous superlative came back on Nov. 30 at home against Ohio-Chillicothe (.582). One mantra that has driven the Eagles to their winning streak would have to be, "sharing is caring." The home squad dished out 24 assists on their 31 shots made, the former tying a season high also set back on Nov. 30. "Our guys did a terrific job moving the ball tonight," said head coach Preston Spradlin. "I believe our pass count surpassed 260 for the night. One of the things we have been honing in on is to move without the ball and look for each other. And, that's how we've been getting our best looks, is when we look to distribute and move." Notching another season (and career) best was senior point guard A.J. Hicks. The floor general from Norcross, Ga., tied his career high in assists that he set two nights' previous, tabbing 11 assists for the second contest in a row. Hicks also produced one of his most efficient nights, only surrendering two turnovers. Nine Eagles found the scoring column in tonight's matchup. MSU was led by senior forward Lamontray Harris, who poured in 20 points on a 9-of-10 effort. Not too far behind was junior Jordan Walker with 19 of his own. Rounding out the double figure performances were sophomores James Baker and De'Von Cooper, with 12 and 10 points, respectively. 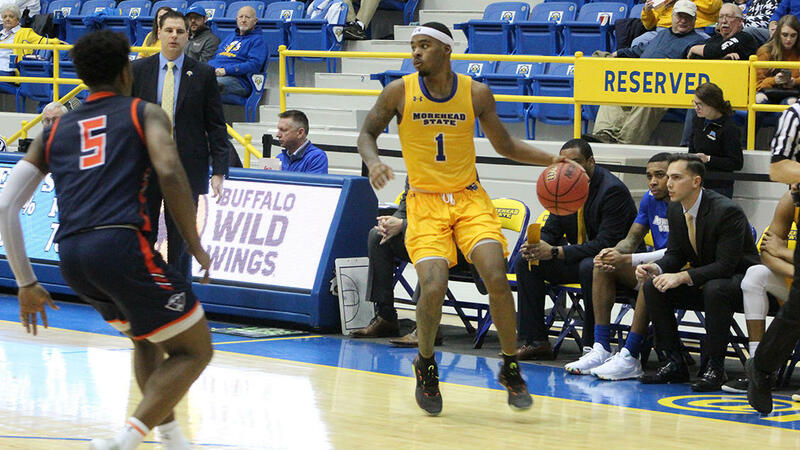 Morehead State was met with stiff resistance on offense, as the visitors went blow-for-blow shooting the rock. The Eagles took a nine-point lead going into halftime, and stretched their lead to as high as 19 with 13:34 remaining. From there, UT Martin connected on nine of its next 11 shots, outscoring MSU 27-13 until the 6:03 stamp. Both teams saw impressive shooting splits, with the visitors logging 32-of-58 (.552), 8-of-19 (.421) from behind the arc, and 71 percent at the free throw line. Not to be outdone were the Eagles, who went 9-for-20 (.450) from long range and hit 14 charity tosses compared to the Skyhawks' seven. The Eagles continue their home-stand next week, for game three of four in their time occupying the home court. MSU takes on Tennessee Tech on Thursday evening. Tip-off will be at 7:35 p.m. ET at Johnson Arena.